In a historical new move for Vulcain in 2009, the famous Cricket mechanical alarm movement is available for the first time in a self-winding version. 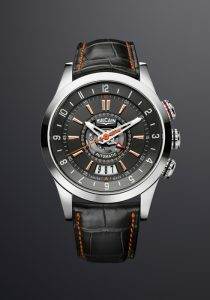 The unprecedented Calibre V-21 is powering the two new Cricket REVOLUTION GMT and Cricket REVOLUTION Dual-Time models. A new era dawns for Vulcain with the arrival of this self-winding alarm movement. No other mechanical movement has made such an indelible imprint on the history of the alarm watch. Since 1947, the hand-wound Cricket alarm movement has been at the heart of Vulcain’s finest hours. 2009 marks a decisive new stage for the Manufacture in Le Locle, with the arrival of the very first self-winding Cricket calibre. This exclusive new 12-lignes (12’’’) movement – Cricket Calibre V-21 – drives the hour, minute, seconds, alarm and date functions. It comprises 257 parts and its two barrels ensure a 42-hour power reserve and a 15-20 second alarm. This Haute Horlogerie movement is crafted according to the most demanding standards and features meticulous decoration including Côtes de Genève and polished and hand-bevelled finishes. The self-winding Cricket V-21 movement is making its entrance into the Vulcain collections by powering the two Cricket REVOLUTION GMT and Cricket REVOLUTION Dual-Time models. Available in steel versions with 42 mm-diameter cases, these two new launches are entirely in harmony with the unmistakable style of the Manufacture from Le Locle. In tribute to the new Calibre V-21, the dials are slightly open in the centre to reveal a transparent glimpse of the first ever self-winding Cricket movement. Applied Superluminova numerals and hour-markers, a new shape of hands, an openworked date display at 6 o’clock and new crowns stamped with the initials of the function set a sophisticated finishing touch to these models. The GMT and Dual-Time models are available with a choice of sapphire crystal case-back – serving to admire the quality and finishing of the rhodium-plated movement – or with Vulcain’s signature triple case-back serving as a resonance chamber. From London to Hong Kong and from Dubai or Mexico to New York or Tokyo, the time around the world is brought within reach thanks to the Vulcain Cricket REVOLUTION GMT, equipped with the new V-21 automatic movement. This 257-part calibre drives the hour, minute, central seconds, alarm and date window displays. The world-time indication in 24 cities of the world is adjustable by an inner rotating bezel activated by a screw-lock crown at 4 o’clock. The new Vulcain Cricket REVOLUTION GMT model comes with a choice of strap in alligator leather or rubber-lined calfskin. Also driven by the new Manufacture-made automatic Cricket Calibre V-21, the Vulcain Cricket REVOLUTION Dual-Time displays the hour, minute, central seconds, alarm and the date through a window. The dual time-zone function is adjustable by the inner rotating bezel activated by the screw-lock crown at 4 o’clock. 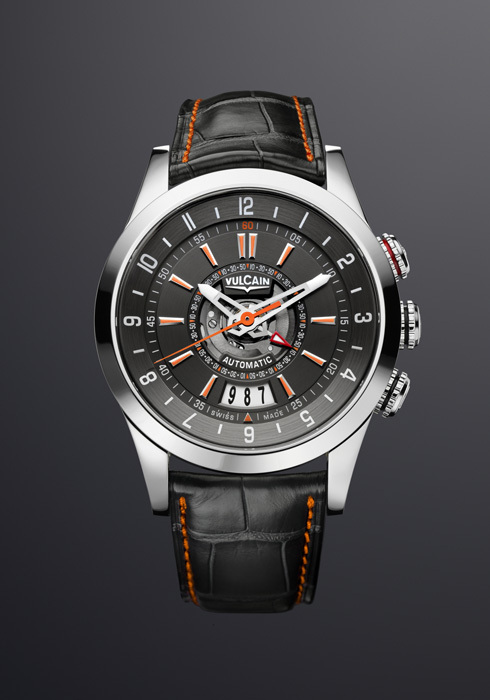 The new Vulcain Cricket REVOLUTION Dual-Time is fitted with an alligator leather or rubber-lined calfskin strap. 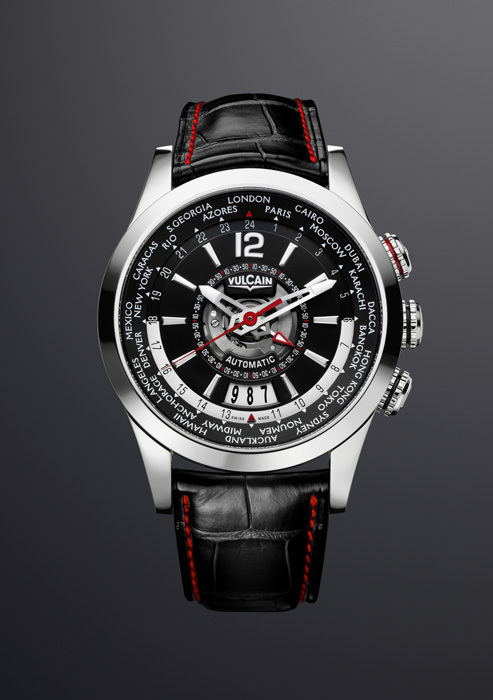 Representing the new generation of timepieces from the Manufacture Vulcain, and equipped with the new Cricket self-winding movement, the new Vulcain Cricket REVOLUTION collection is available in all authorised points of sales as of spring 2009.